Henan Province in central China saw record rainfall over the weekend, but one young couple didn't let the floods stop their wedding plans. 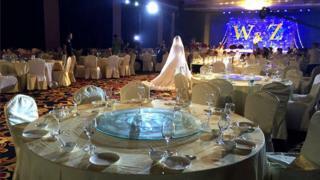 The bride and groom had planned a big ceremony for Saturday, with more than 300 friends and family on the Xinxiang city guest list. But the terrible weather and dangerous travelling conditions meant that only ten turned up, the People's Daily reports. The couple decided to go ahead anyway. "Even though we have no guests, no limousine, no fireworks, and no music, none of that matters - as long as I have you, I'm happy," bride Zhou Tian told her groom. Her words took China's Weibo social media platform by storm, chalking up 12,000 likes, more than 1,300 comments, and 1,600-plus shares of the People's Daily article. "This is true love, two hearts who sincerely love each other - everything else is vanity," writes one clearly-moved reader, expressing the popular sentiment that they proved their devotion by going ahead in the face of disappointment. The guests come in for some stick. "Family and friends didn't come? How unkind," remarks one critic. Some are less impressed. "So she couldn't postpone the marriage?" is one unsympathetic comment, although another reader responds "Marriage isn't a spectacle for others - their own happiness is more important". One Weibo user hopes this isn't the end of the celebrations - "God owes this couple a proper wedding".